It was a mutual love of gardening that first attracted Lily to the husband with whom she shared her later years, Alf "Blondie" Haywood. Lily and Alf, together for almost the past five decades, lived quietly in their Grant Road cottage, beside their attractively terraced garden. Each of them artistic by nature, the couple created surroundings of flowers and shrubs which brought much enjoyment to Lily especially. Tall, attractive and stately of bearing, Lily was descended from some of Sooke's earliest pioneers. The quiet lifestyle which we remember her by was a marked contrast to the adventurous spirit of her forefathers. Lily was a granddaughter of Joseph Poirier Sr. for whom the new school, Ecole Poirier, has recently been named. Poirier left Quebec as a youth traveling west with the fur brigades, reaching Fort Vancouver on the Columbia River. After the Oregon Treaty of 1846 declared that area as part of the American like others of the voyageurs, headed north into British territory. 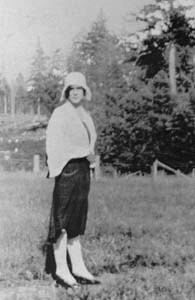 In Sooke, Poirier settled on lad by the Sooke River (now Milne's Landing) before pre-empting property on Grant Road, Poirier and his wife, Ellen Br�l�, raised a large family, most of whom also raised families in the district. As a child, Lily had visited the house of her widowed Grandma Poirier, who she remembered as a very strict little woman in black who always spoke French. Lily's father, Mandus Michelsen Sr. was an adventurer also, a seaman who arrived on this coast from Norway in 1911. Michelsen found employment in Sooke's fish traps industry and met and married Sarah, one of the daughters of Joseph and Ellen Poirier. The large family raised by Mandus and Sarah Michelsen included, beside Lily -- Sarah (Mrs. Bill Vowles), Mandus, Earland "Dadie", Paul, Eric, Agnes (Mrs. Claude Dilley), Christine (Mrs. Jack Blight), Marie (Mrs. Art Hay) and Rolph "Mick". As a young girl in her mid-teens, Lily's good looks caught the eye of another adventurer, James "Jimmie" Goudie, himself a grandson of the early Hudson's Bay trader originally from the Hebrides. Like other Sooke men of the time, Jimmie Goudie had been a sealer in the annual expeditions to the Bering Sea, in the final decade before sealing was banned in 1911. In 1906, he had shipped out on a sailing schooner Diana, whose sunken hull was much later to rest near the Government wharf. When Lily Michelsen became the bride of Jimmie Goudie, times were tough--it was the beginning of the "Great Depression" and those years were not easy for the growing family. Their children were James Donald, who lives with his wife Darla in Sooke today; Dennis who lives with his wife Roberta at 100 Mile House; Bonita, who lives with her husband Ralph Stephens; their youngest son Tim (now deceased), and youngest daughter Ruby, of Kelowna, who recently lost her husband Peter Tymchuk. With her family grown up and the pioneer sealer Jimmie Goudie gone. Lily quietly indulged her passion for flowers, and it was that through gardening that she and "Blondie" Haywood got together. She was particularly proud of her collection of irises. The couple enjoyed socializing with their many friends and family, and going out to dances at the community hall. Audrey Wilson remembers Lily as "a sweet gracious and elegant lady." 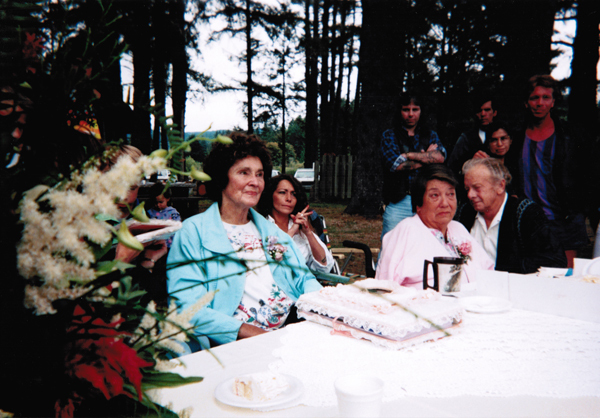 For Lily Haywood's eightieth birthday in 1993, her family organized a party at the Sooke Flats. To help celebrate, guests arrived from all over the province, in addition to many from the community -- today, the grandchildren number 18, her great-grandchildren add up to 23, and there are three-"great-greats". Lily's knowledge of Sooke's history, and her generous sharing of time to assist with the accurate recording of history for the Sooke Region Museum, were demonstrated once again as she proofread Sooke's recently published volume "The Sooke Story." Her presence will be missed. The funeral service is to be at Sands Memorial Chapel in Colwood at 11 a.m. on Saturday, Jan. 6, proceeding to the Sooke Harbour Cemetery. A memorial for her recently deceased son-in-law Peter Tymchuk will take place at the cemetery also. Following this, a reception is to be held at the Sooke Legion.